Red raspberry is said to have been first discovered on Mount Ida by the Olympian gods while out searching for berries. Cultivation of the herb became widespread throughout Europe during the Medieval Ages, as were its uses. Although most commonly used during pregnancy and for menstrual complaints, this is not just a women’s herb. Red raspberry leaf exerts a tonifying effect on the uterus due to its estrogen-like properties. It is often prescribed for dysmenorrhea, menorrhagia, morning sickness during pregnancy, to relax uterine muscles and stimulate contractions during the early stages of labor, strengthen the uterus post-partum and to ease menopausal hot flashes. Anecdotal evidence suggests that it may also encourage milk production for breastfeeding. Red raspberry leaves also contain a number or vitamins and minerals that may help to combat vitamin deficiencies. The leaves also act as a “blood purifier” because the nutrients encourage the production of new, healthy blood. These components — vitamins A, B , C, D, E , iron, calcium, phosphorous, manganese, beta carotene, chlorogenic acid, and glutathione — offer nourishment to all tissues. Other active constituents include anthocyanidins, ellagitannins, flavonols such as quercetin and kaempferol, catechins, and phenolic acids. The leaves of the raspberry plant contain tannins — an astringent component useful for drying mucus membranes such as those found in the mouth and digestive tract. Thus a tea of these leaves is useful as a gargle to heal canker sores and gingivitis, or as a beverage to help ameliorate GI tract disorders, and respiratory tract infections where there is an excess of mucus. 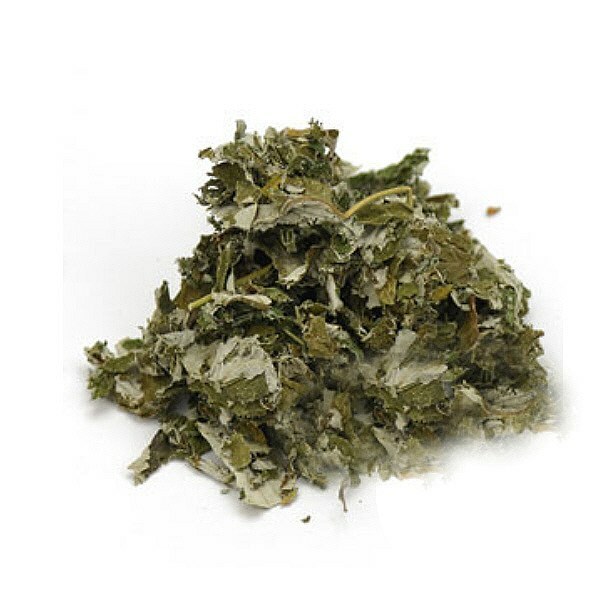 The herb also acts as a diaphoretic, making it useful during a fever or in cases of influenza. It also has a diuretic effect and its slightly bitter taste stimulates bile production and relieves nausea. This tea may be helpful for diabetics due to its vasodilatory and antioxidant effects. It is also said to be beneficial for the skin, nails, teeth and bones — likely likely due to the high mineral content. To brew a cup of red raspberry leaf tea, simply pour one cup of freshly boiled water over 1-2 teaspoons of dried leaves. Cover and let steep 10-20 minutes. Sweeten if desired. In pregnancy, a typical dosage might be 2-3 cups of tea per day throughout the third trimester. RED RASPBERRY LEAF MAY EXERT SOME ESTROGENIC EFFECTS AND THUS SHOULD BE USED WITH CAUTION IN CASES OF BREAST, OVARIAN, UTERINE AND CERVICAL CANCER. IT SHOULD BE AVOIDED DURING THE FIRST TRIMESTER OF PREGNANCY. CONSULT A DOCTOR, NATUROPATH OR MIDWIFE FOR USE DURING THE SECOND AND THIRD TRIMESTERS OF PREGNANCY. “Antioxidant activity in fruits and leaves of blackberry, raspberry, and strawberry varies with cultivar and developmental stage”.Wang SY, Lin HS. J Agric Food Chem 2000;48:140-6. “Healing Teas”. Antol, Marie Nadine. Avery Pulishing Group. 1996. “Scavenging capacity of berry crops on superoxide radicals, hydrogen peroxide, hydroxyl radicals, and singlet oxygen”. Wang SY, Jiao H. J Agric Food Chem 2000;48:5677-84.